We'd visited Salisbury back in the Dark Ages (the 1970s really, but sometimes it seems that long ago) and decided to return to take a second look at the cathedral as it was the one that made the biggest impression on us. Having a few days between housesits it seemed the perfect time to achieve this goal, and our visit was made all the more enjoyable by our small but efficient and cozy PearTree apartment. It's location was within easy walking distance of the train station, Salisbury's downtown and High Street as well as the cathedral and museum. There's nothing like an English garden to make me smile and this row of homes was just down the street from our apartment. Across the river and over the bridge is a park that provided us with our first view of the cathedral. No matter the time of day or weather there were always people taking advantage of the park. Seniors strolled hand-in-hand, young mothers pushing baby strollers gathered to walk and chat, while the younger set rode scooters or played soccer. To reach the cathedral requires going through a stone gate. The massive wooden doors are opened and closed each day to admit visitors to the cathedral grounds or 'close'. The building next to the gate was being renovated, but even the scaffolding and red netting doesn't detract from its medieval charm. So many things about Salisbury Cathedral make it unique, perhaps the most notable is it was built in 38 short years. Considering its size and the exquisite detail on the exterior that's impressive. Its spire is Britain's tallest at 404 feet/123 meters. It also houses the world's oldest clock. It has no face and only strikes the hours. The Cloisters are also the largest in Britain and it is this part of the cathedral that I remembered from our first visit so long ago. Unlike most cathedrals they were not part of a monastic foundation but rather designed for reading, relaxation and processions. The interior of the cathedral is light and airy - a result of renovations done in the late 1700s where medieval stained glass was removed and painted medieval ceiling decoration whitewashed. An interesting fact about these flags of various regiments: they will only be removed from the Cathedral after they're completely deteriorated and even the threads disintegrate. (Dust to dust?) Note the side view of the world's oldest clock on the right. The baptismal font is quite recent (2008). It offers lovely reflections of the windows and ceiling. At the far end of the cathedral is the Prisoners of Conscience window installed in 1980. There were so many other details to admire and view. Here's just a small sampling. Another must-see experience while visiting Salisbury Cahtedral this year is its copy of the Magna Carta. The best preserved of four surviving copies, it is on exhibit in the Chapter Houses to celebrate the 800th anniversary of the signing. 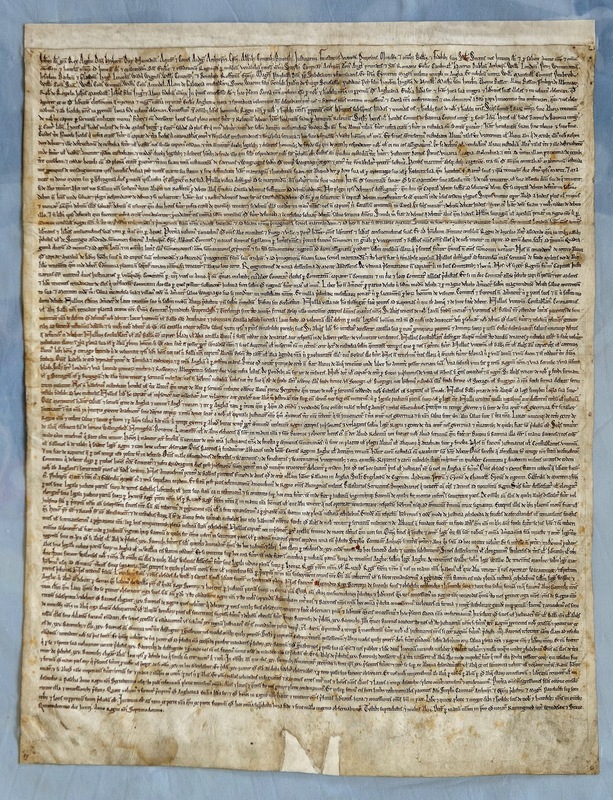 The Magna Carta is considered the cornerstone of modern democracy and liberty. It inspired the Universal Declaration of Human Rights, the American Bill of Rights and the constitutions of many democratic countries including Canada. The Magna Carta states no one, including the king, is above the law and that everyone is entitled to a fair trial. It is housed in this small tent inside the Chapter House. We were fortunate to be able to walk straight in to see the Magna Carta. Guides told us they are expecting long cues this summer when the tourist season begins in earnest. Another new feature since our last visit is the Refectory glass roofed restaurant. We opted for tea and dessert. Strolling around Salisbury we could literally have taken a photo every few seconds as it's a tourist's delight and fits the bill of the quintessential English town. One of our favourite things about the UK is Sunday Roast and when Sunday rolled around we seized the opportunity to find a pub. The Rudder River rushes through the centre of The Old Mill dining room and is visible via a glass topped viewing panel. The interior is charming and cozy. To the bottom left is an open fireplace. We sat at the table right next to the fireplace and this window. The food (we both opted for the lamb) was delicious, served with Yorkshire pudding, roast potatoes, green beans, mint sauce and gravy. This is the side of the Old Mill. The garden gate of the home on the left (above) provided this lovely view of the cathedral. Our stay in Salisbury was far too short, but we don't mind as we're off to our next housesitting gig in Winchester to look after Poppy. 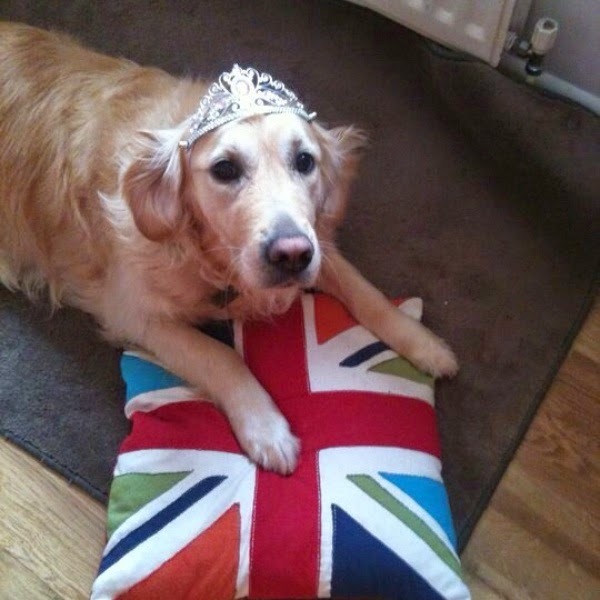 Looks like we're in for a royal time!